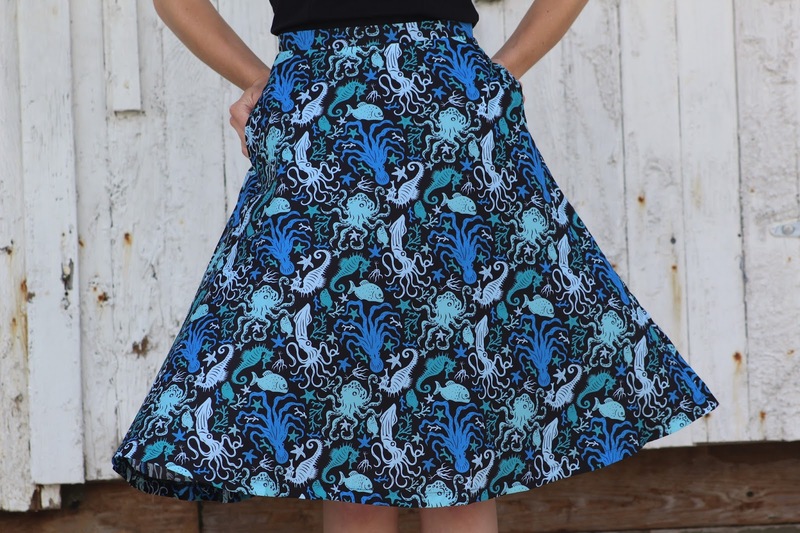 I don't think there will ever come a time that I will stop adding beach themed and nautical clothing to my wardrobe and there was no questioning this fabulous skirt, it belongs with me! It features the cutest pattern and I love the different shades of blue. This skirt is light and airy for summer, with a cotton netted petticoat and it also features pockets - it was perfect for a walk at the beach recently. My Collectif halter top has been worn a lot lately - it's great with different skirts and trousers as it is such a versatile top. Most of my clothing purchases this year have been separates as I found it was something I was lacking and being able to mix great pieces is always a plus. Speaking about separates, Banjo and Cake (via Too Fast) has a lot of great choices and and they are really good quality pieces. I will be blogging a few more garments from them too - so keep an eye out for future posts. I am wearing size small and find the sizing across their range of clothing to be accurate . I also can't believe that Christmas is just around the corner.. And my birthday. I have already started purchasing gifts and I do look forward to decorating a bit. I need to get to the sewing store this week to buy some interfacing so I can finish making my new Christmas skirt, there is always something I need at the store but I tend to get distracted at times looking at fabric. I will be wearing and blogging about my Christmas skirt sometime during December. Such a fun skirt! I love dressing in theme! Great photos too! I'm looking forward to seeing your new Christmas skirt. I love it when you showcase things you've made! The skirt is divine and the sandals are perfect for it. Super-duper adorable skirt! I could see it looking really great with a chambray shirt, too. You can never have too many nautical looks, they are super for every occasion. Can't wait to see your Christmas skirt.